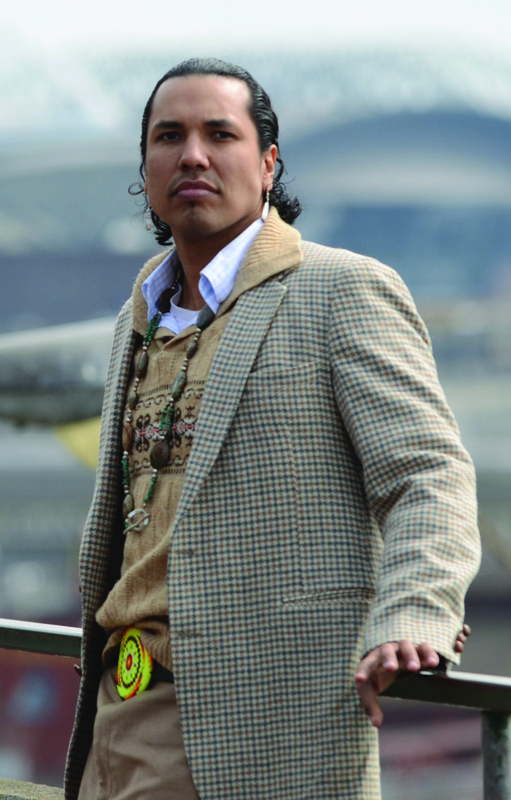 Author, entrepreneur and member of the Blackfeet Nation Gyasi Ross will deliver the inaugural Claire M. Hubbard First Peoples of the Plains Lecture on Oct. 11 at the University of Nebraska-Lincoln. Ross' talk was made possible by generous contributions from Dr. Anne M. Hubbard and the Claire M. Hubbard Foundation. The goal of the annual lecture and surrounding events is to help advance the understanding and appreciation of the cultural heritage of the First Peoples of the Plains. Ross will deliver his presentation at 7 p.m. in the Ethel S. Abbott Auditorium of the Sheldon Museum of Art, 12th and R streets. The lecture, "The Brilliance of Indigenous Mentorship and the Current Crisis to Native Communities When Mentorship Disappears," is free and open to the public. Ross, who lives in Seattle, graduated from Columbia Law School and is a practicing attorney with Crowell Law Office-Tribal Advocacy Group, specializing in the economic development of tribes. Ross' family comes from the Suquamish Nation and Ross has continued his family's storytelling legacy with the publication of his first book of short stories and poems in 2011. He is also a frequent contributor to the Seattle Times, Indian Country Today and the Huffington Post. The Oct. 11 event will be celebrated with free cultural offerings and a public reception in Sheldon's Great Hall prior to the lecture. In conjunction with Ross' appearance, the University of Nebraska State Museum will offer free admission for three days only, Oct. 11-13, to Morrill Hall, south of 14th and Vine streets on the UNL City Campus. On the afternoon of Oct. 12, a free program of Native American family activities will be offered in Morrill Hall. Visitors are encouraged to tour the First Peoples of the Plains Gallery that was renovated in 2011 with gifts from Anne Hubbard and the UNL Class of 1987. Friday, Oct. 11, Sheldon Museum of Art: 5-6 p.m., Kateri Warrior Drum and Dance Group from the St. Augustine Indian Mission in Winnebago in the Sheldon Sculpture Garden; 6-7, reception in Sheldon's Great Hall with roving activities in museum galleries and the Ethel S. Abbott Auditorium, including a poetry slam in the auditorium with emcee Matt Mason, poets Chris August, Dan Leamen, Zedeka Poindexter and Katie F-S of the Nebraska Writers Collective; guided tours by student docents highlighting paintings by Native American artists in the permanent collection galleries; 7-8:30, Claire M. Hubbard First Peoples of the Plains Lecture by Gyasi Ross, followed by a discussion and question and answer session with Gyasi Ross and Judi gaiashkibos, executive director of the Nebraska Commission on Indian Affairs. Saturday, Oct. 12, University of Nebraska State Museum, Morrill Hall, south of 14th and Vine streets: 1:30-4:30 p.m., First Peoples Celebration family event. Focused educational activities will help children and families explore together the heritage and culture of Native Americans. Free activities will feature story tellers, dance, beading, games, music, flint knapping, art, poetry, language and a full-sized tipi erected in Elephant Hall. Visitors are also encouraged to tour the First Peoples of the Plains gallery. Morrill Hall will offer free admission Oct. 11-13. Admission to shows in Mueller Planetarium will be free on Oct. 12 only, regular planetarium admission applies on Oct. 13 (there are no planetarium shows scheduled on Oct. 11). Dr. Anne M. Hubbard of Omaha is a graduate of the University of Nebraska Medical Center and leads the Claire M. Hubbard Foundation, established by her mother's estate. Claire Watson Hubbard was a Boston native and graduated from Regis College in Massachusetts. During World War II, she was a dietitian for the Army and served four years at Walter Reed Army Medical Center. She met Nebraska native and physician Theodore "Ted" F. Hubbard in Washington, D.C., and they married in 1950. Ted Hubbard was a graduate of the University of Nebraska where he received a bachelor's degree and then a doctor of medicine in 1946. He completed an internship and served two years in the Army, stationed at Walter Reed Army Medical Center. The Hubbards moved to Omaha in 1953 and raised two children, Anne and Theodore Jr. Ted Hubbard became a pioneer in the field of cardiology and dedicated his career to the people of Nebraska and western Iowa. He died in 1995 and Claire died in 2011. They established charitable family foundations through their estates to continue their philanthropic ambitions. The Hubbard family has generously supported the University of Nebraska over the years. Their contributions have benefited the University of Nebraska Medical Center, UNL, University of Nebraska State Museum and its branch museum at Ashfall Fossil Beds State Historical Park and University of Nebraska at Omaha.